Whether it&apos;s for a relaxed wellness holiday with good friends, a romantic 5-star weekend with your loved one or a varied trip with all the family: the Green Spa Resort Stanglwirt is always the perfect destination. No matter how you like to spend your time out from your daily routine, at the Stanglwirt you&apos;ll find a unique combination of beautiful scenery, luxury, sport, wellness, entertainment and deep relaxation. And on the subject of feeling at home, you'll find everything you could wish for in our comfortable, luxuriously equipped rooms and suites to make your stay a wonderful one. Here and everywhere in the hotel you'll enjoy the best of nature - in the form of untreated Arolla pine, pure wool and fine linen. The Stanglwirt was the first and only hotel in Austria to be included in the "Gold List" of the 142 best hotels in the world, produced by the publishers of the renowned international travel bible, Condé Nast Traveler. The magazine particularly highlighted the outstanding newly expanded wellness and spa facilities. In our 5-star spa, your personal well-being is our top priority. During your luxury holiday, our highly trained wellness team will treat you to soothing massages, health-promoting therapies and exquisite beauty treatments from head to toe. For an amazing experience for body, mind and soul, visit our water worlds and sauna complex. Covering a total area of more than 12,000 square metres, our Austrian spa resort boasts countless highlights. Recharge your batteries and soak up the peace and tranquillity in the rock pool, organic pine-clad sauna, saltwater pool, waterfall grotto or panoramic relaxation areas. At the Green Spa Resort Stanglwirt - possibly the best wellness hotel in Austria - we make it easy for you to feel good. The new children&apos;s water world is rather more action-packed – it has been specially designed to make sure our younger guests have loads of fun. The 120-metre-long water slide, the first pool cinema at a hotel, and separate pools for babies and toddlers, ensure safe swimming for everyone and all-round fun. At the eco-friendly Green Spa Resort Stanglwirt, water is omnipresent. The crystal-clear drinking water is of the highest quality and comes directly from the hotel&apos;s own Kaiser spring, which also supplies all the wellness facilities. "Wellness in Tyrol": at the Stanglwirt, this means a refreshing experience for all your senses. Thanks to a modern heat pump system, our own water also serves as an abundant andsustainable energy source for the wellness worlds, and is even used for air-conditioning in the storerooms, offices and conference rooms. Using this precious commodity sensibly is entirely in line with the sustainable eco-friendly ethos of the Stanglwirt – and it tastes good, too. That&apos;s why you can enjoy our Kaiserwasser water wherever you go, not just in your room but also in all of our restaurants. And there are so many other "home-grown" culinary delights, such as our delicious Stangl Alpine cheese from the hotel&apos;s own cheese dairy and fresh milk from our own cows. Tennis fans may also develop a taste for the Stanglwirt, where they can choose from a total of eight outdoor courts and six indoor courts. Horse-riding enthusiasts love coming to the Stanglwirt, too. In the riding school, our noble Lipizzaner horses, reared at the first private Lipizzaner stud in Austria, are waiting to greet you. Just next door, there&apos;s plenty more for you to enjoy. There&apos;s always a great atmosphere in the "Auf der Tenne" hotel bar. Then there&apos;s the legendary white sausage party, the big Aprés Ski alpine cabin party that takes place at the Stanglwirt in honour of the skiers taking part in the famous Hahnenkamm race in Kitzbühel. We also offer numerous very special options for those who prefer to hold a private party, or who want to make their wedding unforgettable. Our Events team will be happy to advise you. Enjoy the beautiful scenery from high up on horseback, or learn classical riding here at the Stanglwirt. The Stanglwirt is far more than just the ideal place for rest and relaxation. The unique ambience of our Green Spa Resort also makes it the perfect location for hosting your special event. Staying at the Stanglwirt is simply always a pleasure. 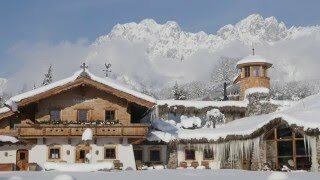 Book now to enjoy a well-earned feeling of well-being and experience a holiday that you&apos;ll remember for a long time to come in this remarkable energy centre for body, mind and soul... "at home at the Stanglwirt", at our hotel in Kitzbühel. Enjoy a memorable stay at the foot of the majestic Wilder Kaiser mountain, recharge your physical and mental batteries in our unique wellness world in the heart of nature - supplied and heated by the hotel's own Kaiser spring. Savour the culinary highlights in our cosy dining rooms, where we serve delicious produce from our own farm. If you are feeling energetic, try our varied Stanglwirt world of sport, including our private Lipizzaner stud and riding school, our driving range and Golf Sport Academy, the tennis centre and internationally renowned PBI Tennis School, the hotel's own ski school, the large Fitness Garden with medical fitness facilities and so much more. Children's eyes will light up when they see our very own children's farm, not to mention the extensive programme of entertainment for children and youngsters, rounding off the wide range of activities here for every generation. A huge variety of other attractions are waiting to be discovered throughout the year...for more than 250 years, we have been here for our guests every day bar none! Explore our media library & experience unique views up close.